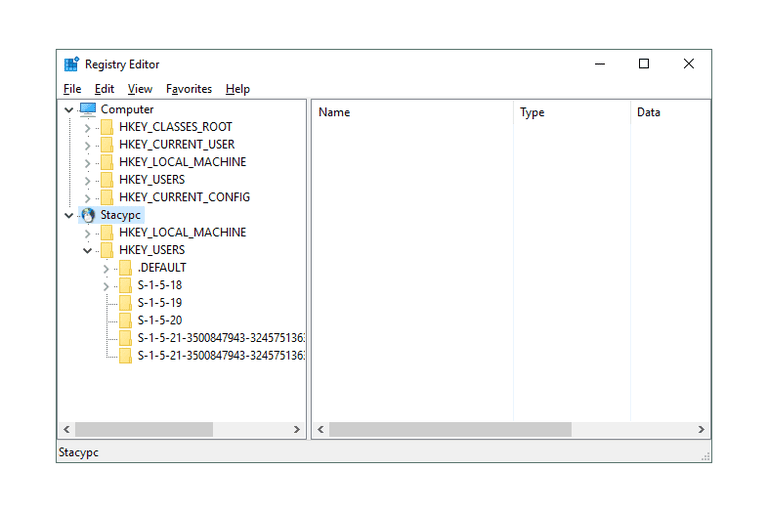 Remotely connecting to another computer's Windows Registry isn't something you'll do regularly, if ever, but Registry Editor does let you do it, assuming a number of things are in order. Remote registry editing is a much more common task for tech support and IT groups than the average computer user, but there are times when remotely editing a key or value in another computer's registry can really come in handy. Maybe it's something simple like faking a BSOD on April Fool's Day without ever visiting the other computer, or maybe a task with a bit more value like checking the BIOS version on a PC two floors down. Regardless of the reason, accessing a registry remotely, over your local network at home or at work, is really simple. Time Required: Using Registry Editor to connect to a remote computer's registry should only take a minute or two, assuming the remote computer is working, connected to your network, and is running the necessary service (more on that below). The steps outlined below will work to connect you to a remote registry in all commonly used versions of Windows, including Windows 10, Windows 8, Windows 7, Windows Vista, and Windows XP. Open Registry Editor by executing regedit from any command line interface in Windows, like Command Prompt or the Run dialog box. Type into the large empty space the name of the computer you want to remotely access the registry for. The "name" that's being requested here is the hostname of the other computer, not the name of your computer or the name of the user on the remote one. See How to Find a Hostname in Windows if you're not sure what to enter here. Most simple networks won't require any change to the Object Types and Locations fields, which should default to Computer and whatever workgroup the computer you're using is a member of. Feel free to adjust these settings if you have a more complex network and the computer you want to make remote registry edits to is a member of a different workgroup or domain. If you get a warning that says "An object (Computer) with the following name cannot be found: "NAME". ", check that the remote computer is properly connected to the network and that you've entered its hostname correctly. You might need to enter credentials for a user on the remote computer so that you can verify that you have access to connect to the registry. If you get an "Unable to connect to [name]." error, you may need to enable the Remote Registry service. See "How to Enable the Remote Registry Service in Windows" section below for help doing that. Now that you're connected, you can view whatever you like, and make whatever registry edits you need to make. See How to Add, Change, & Delete Registry Keys & Values for some overall help. Don't forget to back up any keys that you're making changes to! See How to Back up the Windows Registry for an easy tutorial on doing this. The "Access is denied" messages that you're probably getting on HKEY_LOCAL_MACHINE and various keys under the HKEY_USERS hive are likely due to the fact that you don't have administrator privileges on the remote computer. Give your account administrator access on the remote computer and then try again. The RemoteRegistry Windows Service must be enabled on the remote computer you wish to view or edit the registry on. Most Windows installations disable this service by default, so don't be surprised if you run into this problem when you try to access a registry remotely. Open Control Panel on the computer you want to connect to. Go to Administrative Tools, and then Services. You can also open Services via the Run dialog box with the services.msc command. Find Remote Registry from the list of service names in Services and then double-click or double-tap it. From the Startup type drop-down box, choose Manual.. Choose Automatic instead of Manual if you want the RemoteRegistry service to run all the time, helpful if you know you'll want to connect to this computer's registry again in the future. Select Start, followed by OK once the service is done starting. Close the Services window, and any Control Panel windows you might still have open. Now that the RemoteRegistry service is started on the remote computer you want to edit the registry on, head back to your computer and try connecting again.